If you're anywhere near my age (early 40's), then you've certainly heard of Captain Power and the Soldiers of the Future. If you haven't, then I feel sorry for you (*kidding). 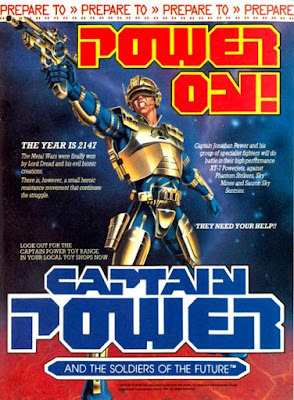 Captain Power was a kids television show that ran for a single season from 1987-1988. It was, for all intents and purposes, the new "big thing" for kids in way of a toyline and accompanying television show, much in the way that He-Man and the Masters of the Universe had done. Speaking of which, Mattel was the company responsible for He-Man, and by this time the show had been off the air for 2 years and they were in desperate need of a new hit. 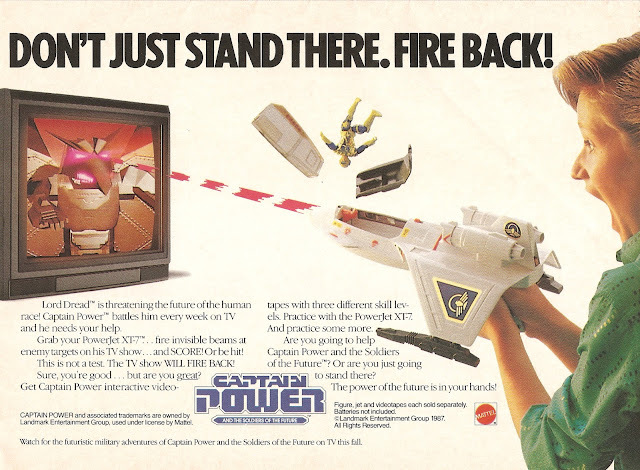 Captain Power looked to be their new "hot item", and as luck would have it, before being approached by the shows creator, Mattel was already working on a new technology that would incorporate an interactive element. When the show's creator Gary Goddard (director of Cannon's live action Masters of the Universe film that same year) approached them about possibly producing the tv show and toy line, Mattel felt they found the perfect vehicle to incorporate their new technology into the mainstream in a way that had never been done before. Fresh off his stint directing the live action Masters of the Universe film for Mattel and Cannon Films, Gary Goddard set out to create his own live action sci-fi series. First he came up with a name, and once he realized Captain Power hadn't already been taken, he immediately trademarked it, and built the idea and concept around it. After realizing the complete title (which sounds eerily similar to Mattel's other successful toy brand), Goddard then came up with an outline of the show, characters, backstories and designs. He wanted to create something new and different; a brand that would change the face of television and toys forever. With the television show, Captain Power was going to me markedly different than anything done before....or since. For starters, it was going to be for kids, but live-action, and would also incorporate CGI for the very first time in a tv show. Rememeber, CGI was still in it's infancy, and with the exception of The Last Starfighter, hadn't really been used this way before. It was also going to be interactive for the kids. By using the specific weapons/toys that Mattel would sell, you could fire at specific targets by pointing these gun devices at your tv screen and the targets would go down. Cool right?! 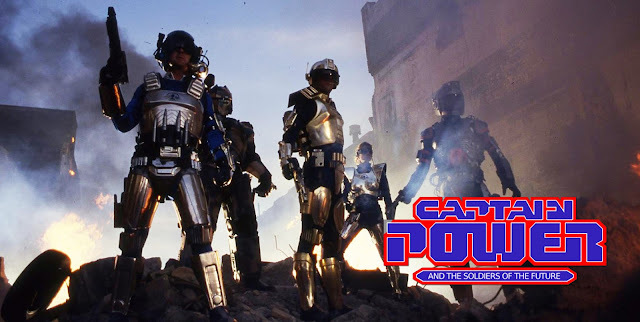 Captain Power and the Soldiers of the Future released to generally positive buzz and did fairly well in both viewership and toy sales initially, but wasn't quite the home run they were hoping for. Once the novelty of the idea wore off, toy sales and viewership began to taper off. The problem was that so much of this was new for everyone involved, especially in the production of the show, which took place in Canada, and it was a bit rocky from the start with a lot of the crew behind the scenes having never worked in this sort of genre before, let alone using never-before-seen computer graphics. The result was a show that missed it's mark for a number of episodes, delivering a hit or miss quality that turned off kids for some episodes, and adults for others. One of the things that worked both for and against it was the fact that they were attempting to tackle many adult themes that wouldn't resonate very well for kids, but would hope to attract an older audience as well. Some episodes it worked, and some it didn't. Despite it's notoriety, or rather it's lack of, one thing needs to be understood about this show, and that is that despite it's reputation and only lasting one single season, Captain Power was way ahead of it's time. Nothing like it had ever been done before, or since, and it was, for all intents and purposes, a cult classic in the making. If you could look past some of it's flaws, and uneven quality, you will find a show that was just as heavy on the action as it was on the dramatic elements. For a show that was primarily aimed at kids, it paved the way for other sci-fi shows that were to come after, like Star Trek: The Next Generation and Babylon 5. And today I have some fantastic news. There is a feature length documentary titled Out of the Ashes; The Making of Captain Power that runs an hour and a half that digs deep into the entire Captain Power franchise from it's inception, to the production of the state-of-the-art television show, toy line, it's cult status and lasting legacy. You hear first hand from the series creator Gary Goddard and many of those involved with the show's production, as well as those that worked on the toy line and the actors who appeared as the titular characters. Really, if you were a fan of either the show or the toys, you owe it to yourself to give this a watch. While not the most fun or engaging, instead choosing to take a more straightforward approach, it's in the abundance of information that makes it fascinating and entertaining, especially if you were or still are a toy collector. This documentary was included in the 2011 DVD set, but can be found in it's entirety here on YouTube. ENJOY! !